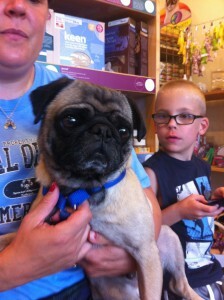 Dooley is a 4 year old, fawn male pug. He is a little underweight he is 16lbs but should weigh about 20. We are looking forward to an update from his foster home shortly. -Update from foster home. Hi my name is Dooley and I am a 4 year old Fawn and Black pug. I was surrendered by my owners because they were moving, but my foster mom is not so sure about that. I cower when she comes near me, but I love my foster daddy and human brothers. And I am very skinny, but I am eating yummy food. My foster mom says that she is starting to see my personality come out. I am starting to play a little bit with my pug sister, but mostly we like to sleep together on daddy’s chair. My foster home has a big backyard and I love to run around it. I really like being with my family, but when they go out I have to go into my crate. I am not too crazy about it but it keeps me from having accidents while they are gone. When they are home I don’t have accidents and I am good about letting them know when I have to go. I also like sleeping in bed with mommy, daddy and my pug sister. I will have more to follow once my true personality comes out. -New update from foster family. Dooley is an awesome dog with boys. He wants to be around them all the time. He has his points when he wants to be playful, I don’t think he ever experienced playing in his previous life, but he is getting better at it. He is a very smart boy and very well mannered. He likes to go for walks and lay in the sun and he really really loves his chew bone and teasing Cinnamon with it. He is a lover dog, he wants to be patted all the time (typical PUG) He sleeps with us at night, but we crate him when we leave. He will pittle on the floor if he thinks he is in trouble and you try to pick him up, but he has not had any major accidents on the floor. He is still skinny, but he looks healthy now.